It's the first of its kind in the state of Florida. 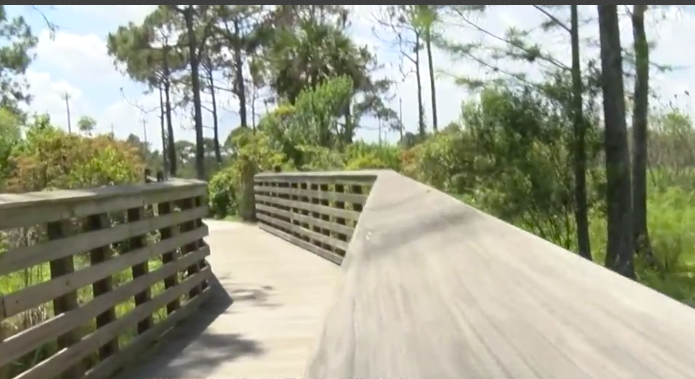 Recently, the North Jupiter Flatwoods Natural Area was certified as an autism friendly trail. It's the first of its kind in the state of Florida. Recently, the North Jupiter Flatwoods Natural Area was certified as an autism-friendly trail. "It's very calming and very peaceful," Alicia Anderson said. Anderson knows the area well she's an Environmental Analyst for Palm Beach County Environmental Resource Management. Now she's helping others better connect with nature. "We actually organized a sensory tour which we highlight bringing you out in the woods and it has a calming effect also," she said. These aren't your typical hikers, in fact, most of the people on these special tours are on the autistic spectrum. "We had to come up with an idea of how can we walk them through the woods and let it be a great experience," she said. So Anderson, along with several other employees with the Palm Beach County Environmental Resource Management Office, partnered with the Learning Academy at the El's Center of Excellence to make the trail autism-friendly by adding additional water barriers, signage and rest areas. "Having a safe place for her to be able to walk and to have a small area to rest or just to enjoy," Isabel Lawton said. Lawton says because of the rest areas and swing bench her 23-year-old daughter was actually able to walk the trail with her. Now the natural area is the first in the state to be accredited by the Center for Autism and Related Disabilities. "It's good that they are thinking of this part of the community, the autism community," Lawton said. A ribbon cutting for the new features at North Jupiter Flatwoods Natural Area will be held April 30.